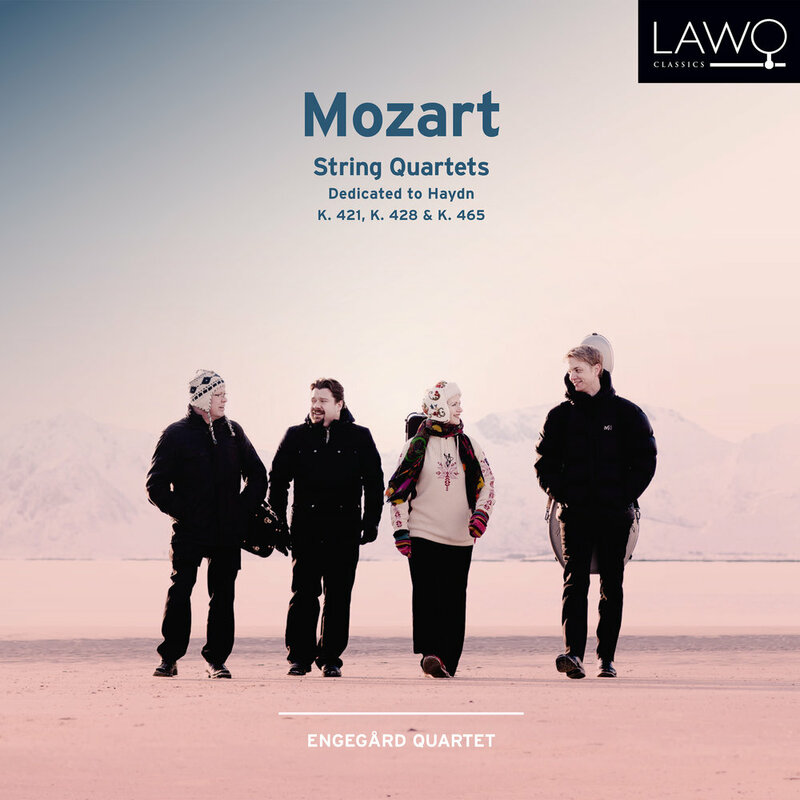 On this recording, the Engegard Quartet present three of Mozart’s six string quartets dedicated to Haydn, the so-called “Haydn” Quartets. The six “Haydn” Quartets were written between 1782-85, while Mozart enjoyed great popularity in Vienna. Mozart had written a series of quartets in his youth, but it had been almost ten years since he wrote the last one. With the “Haydn” Quartets he makes quite different demands on himself, the musicians, and the audience. The structure is not so surprising, here we find fast first movements in what is today called sonata-allegro form, singable slow movements, minuets with trios, and often finale-rondos. But what he fills them with woke Haydn’s admiration and now awakens ours. Haydn’s admiration for his colleague 24 years his junior was expressed through the following words aimed at Mozart’s father Leopold, himself also a capable composer: “I tell you by God as an honest man, your son is the greatest composer I know in person or by name; he has taste and furthermore the greatest compositional knowledge.” Haydn supposedly uttered this after having heard three of the quartets at a house concert at Mozart’s residence, where both Wolfgang and Leopold most likely contributed. The three string quartets comprising op. 41 were written in just a few weeks in a ‘veritable creative frenzy’ in 1842 in what is known as Schumann’s ‘chamber music year’. Schumann gave the three quartets to Clara for her 23rd birthday on 13th September 1842. In the couple’s shared diary she noted: ‘The gift of his three quartets – which he arranged to be performed for me... that very evening... – brought me the greatest joy. About the quartets, all I can say is that they delighted me to the utmost. Everything in them is new, clear, expertly worked out and always idiomatic.’ The fact that Schumann wrote no more string quartets does not indicate that he was dissatisfied with them: in 1847 he wrote to his publisher Härtel that he still regarded the quartets ‘as my best work from earlier times’. And posterity has unanimously shared the view of the eminent Viennese critic Eduard Hanslick that the three Op. 41 quartets ‘are among the all-time jewels of chamber music’. The CD will be available for purchase on the BIS Records online store from 10th July 2018. From the time they began playing together, the members of the Engegård Quartet have worked with Mozart’s string quartets. Now, ten years later, the results can be heard on the quartet’s first release on the LAWO Classics label. 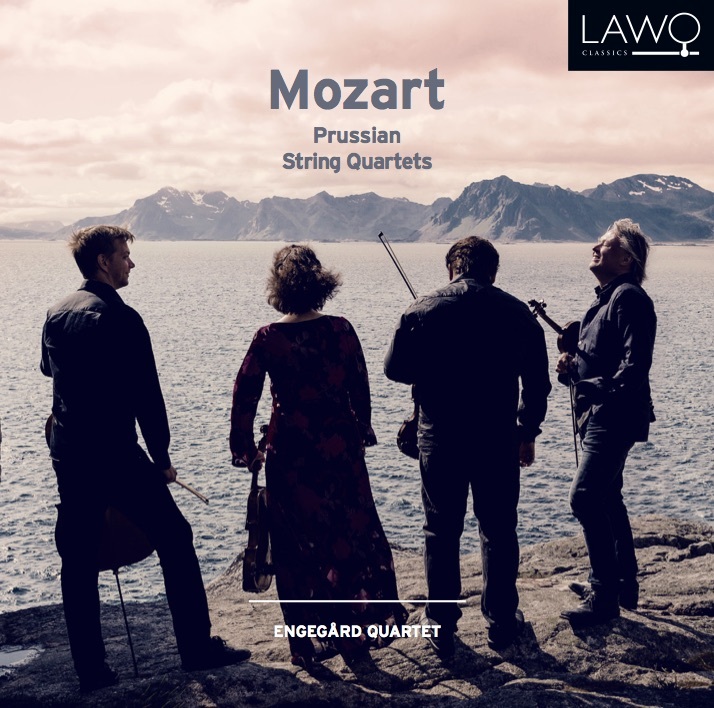 The album features the three “Prussian Quartets”, the last that Mozart wrote, in 1789 and 1790. The nickname comes from King Frederick William II of Prussia, to whom Mozart had intended to dedicate the pieces — a plan not realized when they were published. There is some doubt as to whether it was really the King who commissioned the works, but Mozart had him in mind in any case when he wrote them. And to make them appealing to the King, who was a competent cello player, special attention was paid to the cello part. This recording launches a new phase in the life of the Engegård Quartet, both in terms of programming a themed recording, this time with a pure Nordic programme, and with a new record label, BIS. 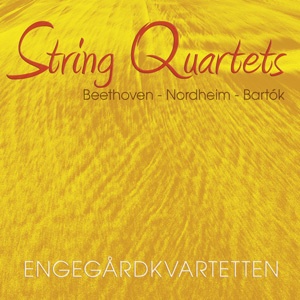 The Engegård Quartet’s latest CD includes two of the Nordic string quartets that have received the greatest international attention, and have the firmest foothold in the quartet repertoire, Grieg´s String Quartet No.1 in G minor op.27 (1877-78) and Sibelius’ String Quartet in D minor op.56 ‘Voces Intimae’. Grieg himself wrote that the G minor quartet, ‘concealed samples of that heart’s blood of which it is to be hoped posterity will see more than a few drops’. The CD also includes the Engegård Quartet´s own commission from Olav Anton Thomessen (b.1946-), his String Quartet No.4, ‘Felix Remix’ (2014). Perhaps the greatest single characteristic of Franz Schubert’s Rosamunde Quartet (1823) is the elusive, longing and perhaps even tragically unconsummated atmosphere that pervades the entire work. Only in the Andante are we really allowed to relax in its peaceful serenity. The ambiguity in the title of Maja Ratkje’s Tale of Lead and Light (2011) reflects the dread which pervaded Oslo in the summer of 2011, and the life-affirming light of Beethoven’s opus 59/1 which inspired Maja’s work. The combination of Haydn Opus 77/1, Nordheim’s Duplex and Bartók’s Fifth String Quartet, was an irresistible challenge for us. A choice of programme from our hearts. We aim for our recordings to be like our concerts, with balance throughout the programme and a feeling of having fulfilled a journey at the end. It is also imperative for us to have a close relationship with the works we record. Our primarius, Arvid, has a special connection with both Bartók’s Fifth Quartet through his mentor Sándor Végh, and with Duplex because of his contact with Arne Nordheim. The great quartets of Joseph Haydn are an ongoing project, and the joyful opening of Opus 77/1 sweeps the listener headlong into our third programme with 2L. The monumental creativity which Beethoven, Haydn and Bartók gave to the genre of the string quartet is our greatest inspiration. In the Harp we find Beethoven at his most entertaining and least problematic, although slightly provocative in the almost forced gentleness of the final movement. We chose to record the String Quartet 1956 including its incredibly atmospheric final Largo in honour of one of Norway's greatest composer, Arne Nordheim. The intensity and individuality of Bartók's 3rd Quartet make it a natural conclusion for us, juxtaposing the most intimate and lonely music with hard-hitting rhythmic sections which only Bartók could bring off. The Engegård Quartet made their first appearance at the 2006 Lofoten International Chamber Music Festival. Inspired by the midnight sun, their musical landscape ranges from glowing core energy to the gentle lyrical sound of Norwegian nature. The Engegård Quartet made their first appearance at the 2006 Lofoten International Music Festival. Inspired by the midnight sun, their musical landscape ranges from glowing core energy to the gentle lyrical sound of Norwegian nature. Edvard Grieg and Leif Solberg are natural choices for this Scandinavian quartet, complimented by the music of Joseph Haydn reflected in a Nordic atmosphere. The strong musical nerve is emphasized by an intense sound production by Lindberg Lyd.